Hard economic times typically spur dismal messages by struggling artists, but the artists behind Pozie poems want to set optimism in motion. 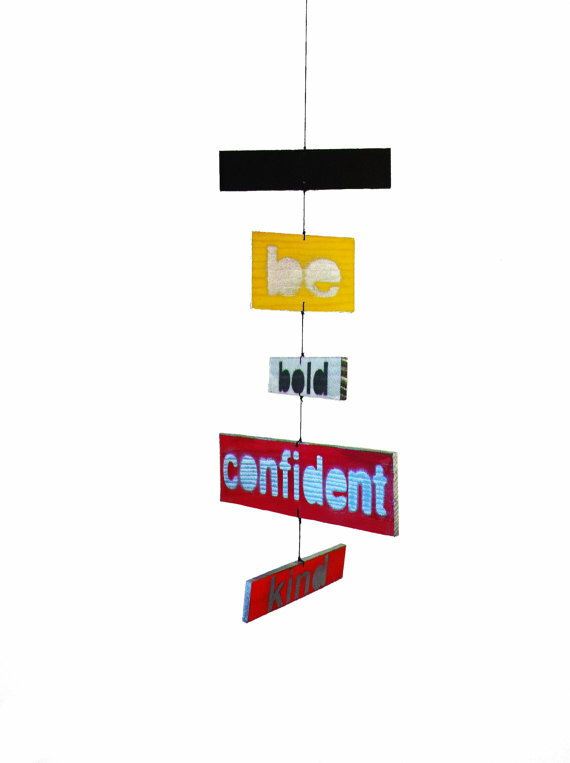 The idea for these brightly-colored mobile poems was born out of the 2008 financial crisis, founders Rion and Kay Merryweather said. “The mood was very somber in NYC and we knew we had to do something to help,” said the husband and wife team. Words like “bold,” “confident,” “enjoy” and “love” are painted on colorful wooden boards and linked together to create inspiring messages that change slightly as the mobiles move. At about $30, these Pozie poems make beautiful, simple and creative gifts or conversation pieces. And the top part is a chalkboard for you to write whatever word (words) you want! You can purchase and view Pozie poems here on Etsy. In honor of my grandmother Yaya’s birthday — April 2, 1936 — I’m posting a poem I wrote about her that I read in this year’s Notre Dame Literary Festival. Today, Yaya would have been 76. My grandmother, Dorothy Coyne, was one of the best people I’ve ever known. She wasn’t a stereotypical grandmother– we weren’t greeted in her house by the smell of baking cookies (she rarely baked) and her voice wasn’t hushed and gentle. She loved dancing and the bustle of cities. She hated the beach and staying on the phone any longer than was necessary. She was spunky, stylish and confident, and when she had an opinion she made sure it was heard. I admired those things about her. I can look back to countless nights sitting around my grandparents’ kitchen table with my siblings or spread out across her plush brown carpet, listening to Yaya tell story after crazy story. Like the time in 9th grade the nuns caught her smoking in the bathroom, and she and her friends filled their mouths with powdered soap to mask the smell but ended up with foaming, bubbling mouths as they explained themselves before the principal. Somehow, her stories always reached a level of pure absurdity; she’d have our entire family keeling over with laughter. Those stories brought us together. Those stories were the best. But above everything else, Yaya was a beautiful and loving woman, deeply committed to her family. Four years later, sitting around the kitchen table or spread out across that carpet, trying to imitate the high-pitched inflection of her voice, her stories still leave us hysterical with laughter. We love and miss you, Yaya. 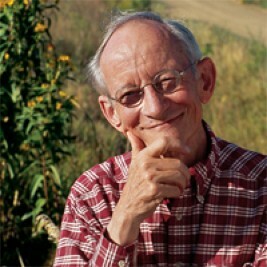 Ted Kooser is a brilliant poet. I stumbled upon his collection, “Delights & Shadows,” a few years ago and it has influenced my writing ever since. Kooser, an Iowa native who was the United States Poet Laureate from 2004 to 2006, writes poems that show glimpses of daily life. He has a way of making the mundane fascinating, of making everyday events awe-inspiring. Kooser maximizes meaning in minimal words. He proves that economy of language is extremely effective. Kooser’s clear, simple, beautiful language is something to be emulated in all writing forms– creative, academic or journalistic. Listen to an interview Kooser did in 2005 with NPR. 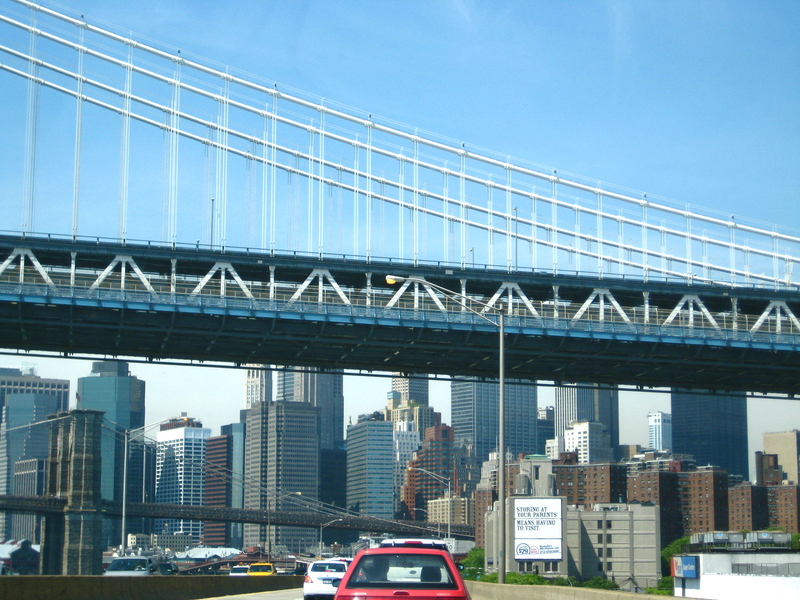 Taken on FDR Drive on my way to Brooklyn! Like I said, lately I’ve been thinking a lot about my next longer piece of fiction. This is always the hardest part, coming up with an idea. “It’s not about what you write– it’s how you write it” might be a writer’s anthem, but still, there’s definitely merit in writing that presents a fresh, new idea. How do you make an old story fresh, or a new story relatable? How do you avoid writing what hundreds of people have already written? One thing I know for sure is that I want to write in the vignette style. Some of my favorite works of fiction are written this way– Jhumpa Lahiri’s Interpreter of Maladies and Sandra Cisneros’s The House on Mango Street. I love how vignettes allow for multiple perspectives on a common theme, and let the writer flip through time effortlessly. There’s also something poetic about a series of vignettes, because each one is pretty brief. Sometimes a never-ending chunk of text, no matter how amazing the writing, is exhausting. Vignettes let the reader and writer breathe. Right now I’m at that stage when ideas are still forming; for a moment they’re immensely exciting and I can’t wait to put pen to paper. Then the feeling fades. What was I thinking? I can’t write about that. Whoosh. Off to the trash. When I was younger, I always saw fiction as a total escape from my suburban life, a chance to travel outside the bubble. I wrote about things I had no experience with: flappers from the 1920s, a drug-abusing mother, children with mental disabilities, a quirky New York City coffee shop. I want my new work to fall closer to home. I’ve found that good fiction writing always involves opening up somewhat. Fiction doesn’t have to be based on your life, but on some level it has to be based on your experiences. When I think of Brooklyn I think of rising housing prices, veganism, the Brooklyn Bridge, trendy bars, artists’ studios, and hipsters. The Brooklyn I see is totally different from my father and grandfather’s Brooklyns. My story would be set only partly in Brooklyn, and would not be focused on history, but it would be interesting to somehow show the area’s development through the lense of a modern-day 20-something-year-old. Vignettes/Flashbacks. Brooklyn. Manhattan. Midwest. Social Networking. Newspapers. 9/11.